The United States and its allies are experts at covering their crimes and finding scapegoats to take the blame for them. They are doing it now with their disinformation campaigns against Russia, China, Iran, Venezuela, North Korea, and Syria. The show trials at the UN’s Yugoslav tribunal, the ICTY, were all about covering-up NATO’s war crimes and spinning lies to blame everything on the Serbs who resisted NATO’s aggression. They use their influence at the International Criminal Court for the same purposes. And now a document has come to light, leaked from the UN’s Rwanda war crimes tribunal, the ICTR, that contains a report on the war crimes of the US supported Rwanda Patriotic Front that invaded Rwanda from Uganda in 1990, conducted four years of terrorist operations against the Rwanda people and government, then in 1994 launched their final offensive and slaughtered their way to power. To discuss this document, marked “Top Secret” I have to burden the reader with a brief history of events from the evidence available in order to give it some context. The night of April 6, 1994 the Hutu presidents of Rwanda and Burundi, Juvenal Habyarimana and Cyprien Ntaryamira, and General Nsabimana, the Rwandan Army Chief of Staff, as well as several other dignitaries and a French flight crew were murdered when the plane they were on was shot down over Kigali airport by anti-aircraft missiles fired by members of the Tutsi-led Rwanda Patriotic Front, or RPF, with the assistance of the governments of several countries. Paul Kagame, the leader of the RPF junta now in control of Rwanda, and who was seen with US Army soldiers at his headquarters two days before the event, gave the final order for the shoot down but he did so with the assistance or complicity of the governments of the United States of America, Britain, Belgium, Canada, and Uganda. It was the United States and its allies, hoping to gain total control of the resources of Central Africa through their proxies in the Tutsi RPF, that provided the military support for the RPF invasion of Rwanda from Uganda beginning in 1990, flowing that support through Uganda. It is known that the missiles used to shoot down the aircraft came from stockpiles the Americans had seized in their first war against Iraq, passed to Uganda, and it was in a warehouse at Kigali airport, rented by a CIA Swiss front company, that the missiles were assembled. In fact, the French anti-terrorist judge Jean-Louis Bruguiere, who spent several years investigating the shoot down on behalf of the families of the French flight-crew, told Boutros-Boutros Ghali, the Secretary-General of the UN in 1994, that the CIA was involved in the shoot down, adding strength to Boutros-Ghali’s statement to a Canadian journalist that the Americans are 100% responsible for what happened in Rwanda. There is strong direct and circumstantial evidence that the Belgian and Canadian contingents of the UN peacekeeping force in Rwanda in 1993-94, known as UNAMIR, were also involved in the shoot down and assisted the RPF in their final offensive that was launched with the decapitation strike on the plane. It was the Canadian General Romeo Dallaire, Force Commander of UNAMIR, who arranged for one axis of the runway at the airport to be closed at the request of the RPF, making it easier to shoot down the plane as it tried to land. Dallaire consistently sided with the RPF during his mandate, gave continuous military intelligence to the RPF about government army positions, took his orders from the American and Belgian ambassadors and another Canadian general, Maurice Baril, in the Department of Peace-Keeping Operations in New York, then headed by Kofi Annan, lied to his boss, Jacques Roger Booh-Booh, about his knowledge of a build-up for a final Ugandan Army-RPF offensive, and turned a blind eye to the infiltration into Kigali of possibly 13,000 RPF combatants when they were permitted only 600 under the Arusha Peace Accords signed in October 1993. It was another Canadian, General Guy Tousignant, who took over from Dallaire after the RPF took power when UNAMIR II helped the RPF consolidate the rewards of its aggression. Burundi was involved both by permitting 600 US Army Rangers to be situated in Burundi in case they were needed by the RPF and by invading Rwanda from the south in May, 1994 to link up with the RPF forces. Tanzania was involved in both the planning of the shoot down and, itself invaded Rwanda from the east and south blocking escape routes for the Hutu refugees fleeing the atrocities of the RPF in their sweep towards Kigali. Finally, evidence indicates that Belgian UN soldiers were in the immediate area of the missile launch site at the time of the shoot down and were also involved. The report into the shoot down of the plane by the French investigative judge Jean-Louis Bruguière was leaked to the French newspaper Le Monde in 2004 and states that the RPF was responsible with the help of the CIA. But before the French judge began his investigation The Chief Prosecutor for the Rwanda tribunal, Canadian judge Louise Arbour, the same woman that framed up President Milosevic on behalf of the USA at the Yugoslav tribunal, was told in 1997 by her lead investigator, Australian lawyer Michael Hourigan, that it was the RPF commando group known as the “Network”, with the assistance of a foreign power, implicating the CIA, that was responsible for the shoot down. At that point Arbour, instead of prosecuting everyone involved, as she should have done, on American instruction, ordered the investigation closed and kept secret thereby making her an accessory to a war crime. The facts relating to Arbour’s action is detailed in Michael Hourigan’s affidavit, still available on the internet and his report to the Office of Internal Oversight of the UN. During the war crimes trials at the Rwanda tribunal defence lawyers, representing the only group targeted for prosecution, the side that tried to resist aggression, members of the Rwandan government, its armed forces and officials as well as Hutu intellectuals, demanded full disclosure of all the evidence the prosecution had relevant to what happened in the war and the allegations of war crimes made against our clients. In the trial of my client, General Ndindilyimana, Chief of Staff of the Gendarmerie, who after a long struggle was finally acquitted, made repeated requests for disclosure of that evidence but we never received the complete disclosure we demanded because over time we became aware that the prosecution had much more material than they were willing to show us. One famous example of this is the Gersony Report made by Robert Gersony, a USAID, official seconded to the UN, who filed a report to the High Commissioner For Refugees in October 1994 setting out his findings that the RPF forces engaged in the systematic massacres of Hutus across Rwanda during their offensive, which he characterized as genocide. This report too was kept secret by the UNHCR and by the prosecution lawyers in our trial who even denied that it existed. But in 2008 my team found it by chance, and in the prosecution files, and I was able to produce it into evidence in the trial, along with a letter from Paul Kagame dated August of 1994 in which he refers to a meeting with Ugandan president Museveni in which the “plan for Zaire” was discussed. Those two agreed that the Hutus were in the way of the “plan” but Kagame stated that they were working with the Belgian, American and British intelligence services to execute the “plan” and the problem would be solved, The world has since seen what this ‘plan” involved; the invasions of Zaire, the extermination of hundreds of thousands of Hutu refugees, the killings of millions of Congolese in the wars that followed, as detailed in the leaked UN Mapping Report of 2010, and the shattering of Congo into fragments to be easily exploited by western mining companies. Yet, little did we know as our trial proceeded that the prosecution had in their hands another document, an internal report dated October 1, 2003 in which their own investigators list and describe in 31 pages the crimes of the RPF forces they had investigated. This report, designated Top Secret, has recently been leaked and a copy was sent to me, among others, to examine and it is as damning of the RPF, and therefore their western allies, as the others. 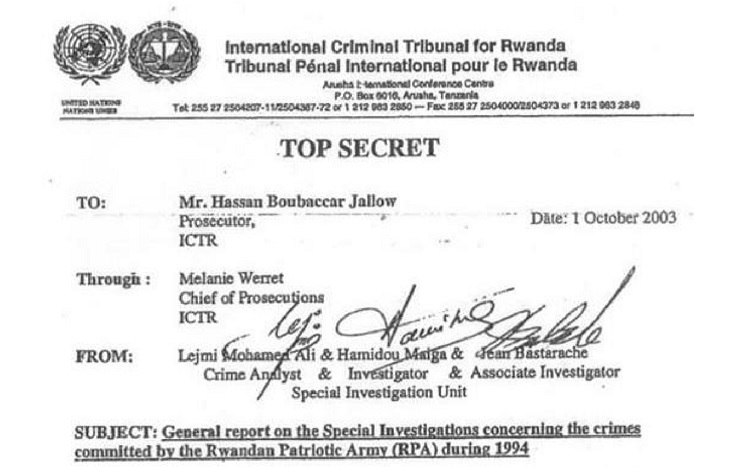 The document, with the subject reference “General Report on the Special Investigations concerning the crimes committed by the Rwanda Patriotic Army (RPA) during 1994’ was sent to the then Prosecutor Hassan Jallow by three members of the Prosecution Special Investigations Unit. 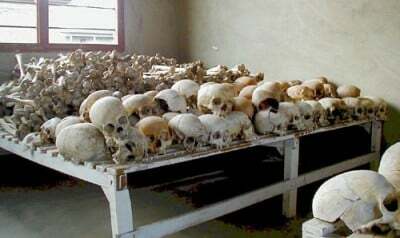 It provides to the Prosecutor the evidence they had gathered that the RPA had committed massacres of thousands of Hutus in various places across Rwanda, for example, Byumba, Kabgayi, Rambara, Gitarama, and Butare, as well as the murder of three Catholic bishops and nine other priests at a church. The circumstances set out in the report confirm Gersony’s Report of similar massacres and also confirms witness testimony we heard during the trials that the RPA forces had infiltrated men into civilian barricades to kill people in order to pin the crimes on the Rwandan government forces and the youth group known as the interahamwe. Finally they provide, once again, further evidence that the RPA did shoot down the presidential plane, confirming the findings of Michael Hourigan in 1997 detailed above and which Louise Arbour had ordered kept secret, confirming the findings of the French report and confirming the evidence we filed at trial to the same effect, including a radio intercept from Kagame to his forces, the day after the plane was hit, celebrating the downing of the plane as a successful operation. It is a very important and damning report. Kept secret. One wonders how many more secret reports they have. “Masaka, Kanombe commune, end of July 1994, – in 5 days approximately 6,000 women children and men were executed with their arms tied behind their back at the elbow. The picture is clear. Yet, to this date not a single member of the RPF or their western allies has been charged for their responsibility for these crimes and Paul Kagame, who ordered these killings, is hosted with smiles by leaders from Canada to France to China. The prosecutors who decided to protect these war criminals, and who, by withholding evidence of what really happened, obstructed justice, conspired to frame up those standing accused before the tribunal, turned international justice into a travesty, and gave these criminals immunity from prosecution and encouragement to commit more crimes have moved on to lucrative positions. Fatima Bensouda, one of those former ICTR prosecutors, is now the prosecutor of the International Criminal Court. Where is the justice for the 6,000 men, women and children murdered at Masaka? Where is the hue and cry for the head of Paul Kagame as there was for the head of President Milosevic and the allegations he faced or as President Aassad of Syria faces? Where is the hue and cry for the head of General Dallaire, or for Louise Arbour, who condoned these crimes, as there was for General Mladic regarding the allegations about Srebrenica? There is none. Instead they are made celebrities, for we live a world in which criminals have seized hold of morality and justice and hanged them from a tree. Christopher Black is an international criminal lawyer based in Toronto. He is known for a number of high-profile war crimes cases and recently published his novel “Beneath the Clouds. He writes essays on international law, politics and world events, especially for the online magazine “New Eastern Outlook.” He is a frequent contributor to Global Research.